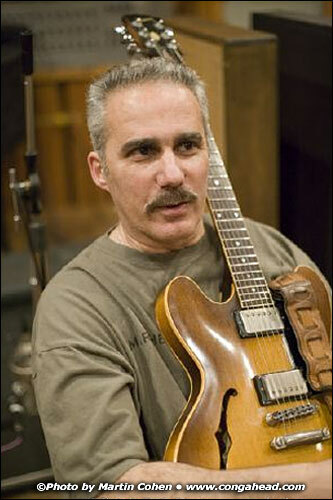 Steve Khan was caught recording his new CD with an all-star cast of musicians at Avatar Studio "A" in Manhattan. On May 23 and 24, I was privileged visit Steve Khan's recording session with John Patitucci and Jack DeJohnette. On the 23rd, we were joined by Steve's longtime friend, the uniquely talented Manolo Badrena. On the 24th, the trio was augmented by Ralph Irizarry and Roberto Quintero for an adventure in creating a very special blend of Latin and Jazz elements. They recorded Wayne Shorter's "Nefertiti"; Herbie Hancock's "Riot"; the beautiful standard, "You Stepped Out of a Dream" (dedicated to the memory of Don Grolnick); and an original piece of Steve's, modeled after "Tito on Timbales" (from "Puente in Percussion"), titled: "Cosecha lo que has sembrado". The composition features incredible solos from Roberto Quintero (congas), Ralph Irizarry (timbales) and Jack DeJohnette (drums). Of course, this was intended as a tribute to Tito Puente and Willie Bobo. With Jack, Ralph and Roberto all together in one room, on this one day, it would have been unthinkable to pass up the opportunity to record such a special session. Over the two days, the band recorded some 12 compositions. And the results were spectacular! I was thrilled to be invited to document such a special event. One never knows if such moments will grace us again! The musicians were Steve Khan, guitar; Ralphie Irizarry, timbales; Roberto Quintero, conga; John Patitucci, bass and Jack De Johnette, drums.